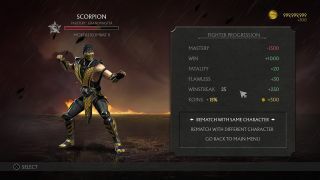 Blind Squirrel Games, who were responsible for Borderlands Enhanced and the BioShock Collection, were apparently working on a remastered version of the first three Mortal Kombat games. This was revealed by Blind Squirrel artist Danny Huynh on a webpage that's since been removed, though a cached version remains. You can see his concept art for the menus and a new feature called "Krypt mode" that was intended to "introduce a new way to play the original trilogy" and looks like a map of a dungeon.